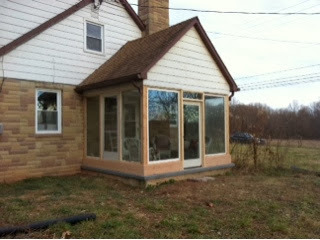 The sun room is getting pretty close to completed. Situated where the sun shines directly into it, all caulked up, it warmed up nicely yesterday in there. The structure needs to be painted inside and out. We have the paint but need 50+ degrees for the paint to dry, and none are in the forecast for days. Last year Ski Roundtop did not open until Christmas last year. The temperatures were too warm to make snow, and we had little to none in November or December. We could have painted this thing on most days last year this time. Will have to wait this year.